I'm feeling as sick as a dog today so I'm going to post a NOTD from last week. First, I want to show each component of my NOTD, China Glaze Zombie Zest and Savvy Garland. I remember distinctly the 'Ewwwww' that came out of me when I saw Zombie Zest in a promo picture for the first time. Gross I thought, it looks like sparkling boogers. However, when it came out (as well as Orly It's Not Rocket Science and SpaRitual Optical Illuison, its brother shades) my initial impression faded into curiosity. I liked green polishes, how would this actually look in person? Luckily for me, the other night I found Zombie Zest at Sally's on clearance for $1.99. I picked it up as well as Garland, which had been in Savvy's recent holiday collection. However, it was just as I had suspected. Zombie Zest proved to be a gruesome color on my nails. Glittery and light catching, but gruesome none the less. My smile line still showed after three coats and I wasn't too pleased that it looked as though I had try to claw lichen off a tree with my bare hands. What to do? I took it off and tried the color over Garland. Now, this is my first Savvy color and though it's a very basic color (shimmering evergreen!) the application is pretty nice and I like the bottle. With two coats of Garland and one coat of Zombie Zest, I definitely had a winner! Look at that beauty! It looks like it's glowing. Doesn't Zombie Zest's glitter look so much more attractive now? 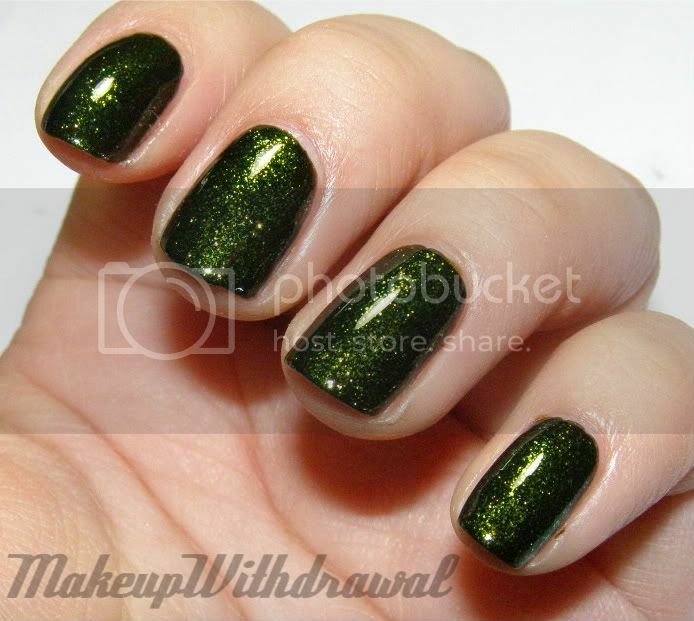 Mmm, a rich olive sparkle instead of a color that looks like it came out of a baby's diaper. I used 1x Essie First Base, 2x Savvy Garland, 1x Zombie Zest, 1x Gelous and 1x Sally Hansen Insta Dri. I know, that's a lot of freaking polish, but I'm doing a bit of durability testing, I'll tell you about it some other time. Now that I showed you my latest favorite layering scheme, how about yours? What color combination did you try out? Was it glorious or just kinda gross?